Here are our best hair dryer for curly hair picks! Once you find ways to tame your natural tendency toward that frizz, your natural volume will shine through. Lustrous, voluminous hair is where it’s at, and you will definitely have it goin’ on! But it all starts with a great hair dryer. Curly hair can be thick or thin, but the main difference between it and straight hair is in the actual texture and fiber of each strand. With ovular fibers (not circular), the hair appears curly as the fibers stack on top of each other. While frizz, unfortunately, comes more naturally to curl girls, so does volume. 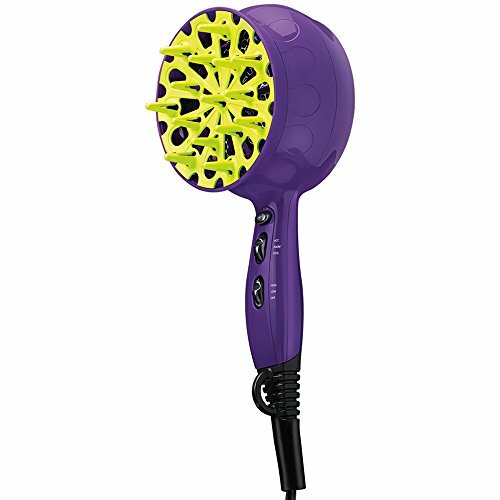 Also, check out our top picks for the professional hair dryers here! 18 Why should curly girls diffuse? Elchim is the leader in Italian engineered hair tools. 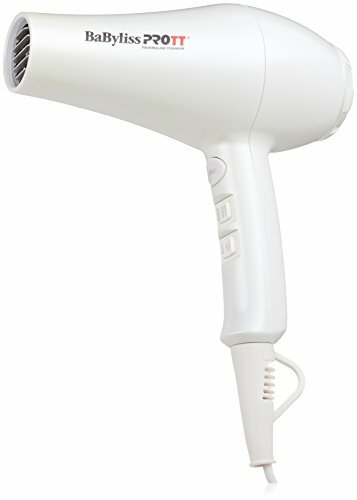 This turbo hair dryer is no different. They always pack a punch of power and durability. This 2000 watt AC motor dries hair lightning fast to deliver the ultimate quieter blow drying experience than the average. The ceramic material gives an ionic boost for healthy results that last over time. You’ll notice less and less frizz while your natural volume starts to shine through. As soon as you try this Elchim, you’ll think back to every hair dryer you ever had and you’ll wonder why you waited so long to purchase one. 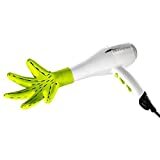 The ergonomic design features a curved handle and shorter nozzle so that you can flip your wrist back and forth with ease while also not being forced to hold your hand so far from your head. 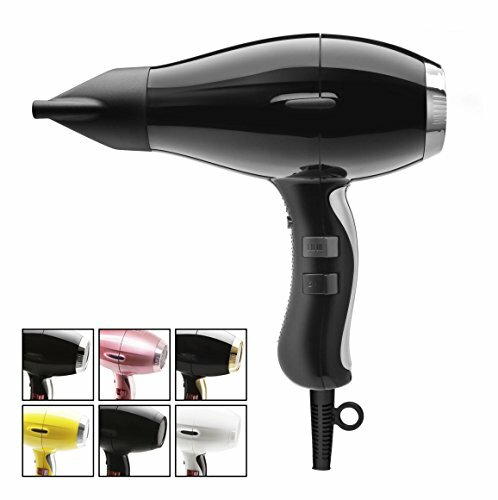 Its compact size also makes it an excellent travel hair dryer. The sleek gold filter on the back twists off for easy cleaning. Not one, but two concentrators are included – one with a wider mouth and one thinner for added precision in taming some of your more unruly curls. There’s a reason you should definitely “go lightweight” with FHI. Weighing in at only a pound, this professional-grade hair dryer will breeze through your hair with the greatest of ease. You can flip your wrist back and forth as much as you want, but it won’t get tired. But you’ll be pleasantly surprised at the impressive strength behind this small but mighty blow dryer. Though it runs quietly, it’s backed by 1875 watts in a strong DC motor, which will allow you to style your hair in just minutes flat. The ceramic tourmaline technology can be controlled through a variety of speeds and settings to give you the utmost power over how you want to style every strand. The results are sleek, shiny, and frizz-free. The concentrator attachment can be used for those days you want to achieve the perfect salon blowout look, while the diffuser will evenly distribute air for even coverage while drying curly or wavy hair. Ceramic tourmaline technology results in frizz free, smoother finishes. Compact design packs a surprising wallop with 1800 watts of power behind the motor. Non-retractable cord makes for more complex maneuvering, especially amongst smaller spaces. High price might require a bit more of an investment. Unique doesn’t even begin to describe this blow dryer and its diffuser attachment. Let’s call it like it is – it looks like a little green hand about to shake hands with your hair. But that’s a good thing! It’s specifically meant to style curly and wavy hair. Ladies with curls, we all know the “scrunching” technique. Well, imagine if you had a third hand to help you with this form of styling. That’s exactly what the Deva diffuser does. Rather than the shape of a traditional circular diffuser, it mimics the shape of your hand as if it were to have air blowing out of it. How cool is that? The ion generating technology will keep all the moisture possible in your delicate curls while getting rid of frizz. There are 2 temperature options with 2-speed choices and, of course, that ever important cold shot button for finishing touches. The nuts and bolts? It features a long 9-foot cord with hanger loop for storage, a concentrator nozzle that is interchangeable with the diffuser “hand”, and a removable filter. Not to mention that it is super lightweight at just a pound. Comes with a one-of-a-kind air diffuser especially designed for curly and wavy textured hair. Super-lightweight design makes work simple with only 1 pound of weight to the hair dryer. Confusing to use for some consumers. High price when purchased at the same time as a diffuser. This super lightweight dryer may look unassuming but don’t be fooled. It comes with 1900 watts of pure professional salon-style power. Six choices between heat and speed let you maintain the ultimate precision in drying versus styling, and the cool shot button lets you set your hair for the day. Tourmaline and titanium are infused into the grill. This means millions of ions are produced to lessen frizz but quicker heat appears the second it’s turned on. A concentrator is included to help maintain control over some of the most difficult pieces or for days when you’d like to turn your curly hair straight without using the direct high heat of a flat iron. Since you’re bound to keep this dryer as your reliable hair styling tool for quite a while, the rear filter just pops right off for easy cleaning. This is a blow dryer for both at-home hair styling and hairstylists in their salons because it is a great option for multiple hair types. Perhaps a bit unique-looking at first, but this dryer sets out to accomplish exactly what it’s supposed to do – make curls gorgeous. You will not need any attachments, especially a diffuser, with this Bed Head because it acts as a diffuser all on its own. Rather than dry your hair in the traditional sense, why not diffuse it the entire way? The air gets spread out in a circular fashion while you hold hair and let it curl itself with the air. No twisting separate sections. Just hold and dry. It’s the absolute best diffuser for curly hair. As you surely know by now, tourmaline and ionic technology is the key to frizz-free hair. Finding the right blow dryer is so important to girls with curls or waves because frizz pops up way too easily. In a fun purple and pink color, this Bed Head will definitely add some brightness to both your day and your style. There are a few must-haves when it comes to purchasing a blow dryer for curly hair and styling it. The first is an attachment or two. The more options you have to be precise with each curl, the better off you’ll be. And don’t forget speed and heat. The perfect way to go is to start with high speed and tempered heat, then switch to high heat and low speed, and then finish it off with a cool shot. Whichever hair dryer you choose, make sure you have the ability to do this. When looking for the right hair dryer for curly hair, you need to consider what works best for your hair. You will need to determine how often you will dry your hair, as well as the accessories you need. The following are the top features of the right hair dryer for curly hair. The average wattage on a hair dryer ranges from 600 – 2,000 watts. Generally, high-quality blow dryers have 1875W. Curly hair needs at least 1500-2,000 Watts, depending on the thickness of the hair. Thick curly hair requires a minimum of 1875 watts. Ideally, curly thick hair needs a higher wattage as well as a cool air button to set the hair and prevent from over-drying. Keep in mind that damaged or fragile hair should first towel dry their hair to absorb extra moisture. It is important to constantly move the dryer over a large area rather than directly pointing at one area. Curly hair takes longer to dry, which means it will benefit from medium-high speeds. The higher the watts of air flow and speed, the higher the chances are of over-drying so that the style does not properly set, even with a cold shot button. Thick curly hair requires full heat settings as multiple heat settings require 2-3 options, including a cool setting. The hot air flow works to create style and dry while cold air sets the style and maintain the hair’s natural design. Ceramic heat technology is fairly few, but it is often combined with other features technology such as ionic and titanium. Ceramic heat is designed to release an even heat transfer, unlike other dryers that tend to produce an unbalanced heat flow. Some hair dryers come equipped with Ionic features that emit negative ions to neutralize positive ions. This is meant to promote shiny, healthy hair. Ionic-infused hair dryers create soft, frizz-free, shiny stands – although sometimes flatter styles. Using a blast of cold air at the end of drying will help set your style. The heat allows the cuticle to open and let dry while the cold and cool air closes the hair shaft while plumping it and locking in style. High-quality hair dryers usually offer several accessories to help you achieve the style you desire. For curly or frizzy hair, diffusers are definitely a must-have. They are the most important attachments that will help set the style and utilize an even air flow that is diffused to help locks keep a natural shape. There are usually add-on attachments that are available in either short or long designs. Concentrators come in 2 versions. One type consists of a flat plate with strategically placed holes to concentrate air flow, while the other type consists of a single nozzle. No matter what hair type you have, you will need a hair dryer that offers an adequate warranty. Users that dry their hair every day tend to wear down the device. A manufacturer warranty proves its confidence in its product and performance. The average product warranty for a hair dryer is at least 2 years while the best is a lifetime warranty. While hair dryers have many similarities, knowing the difference will help you determine which hair dryer is the best choice for your curly hair. If you have curly hair, using a diffuser attachment is the best way to enhance curls without looking fuzzy or damaged. The diffused air will gently dry hair while keeping curls sleek, shiny, and voluminous. Always be sure to not over-manipulate wet hair as it may leave you with frizzy curls. Use the right products to prep your hair. After you shampoo, apply conditioner in the shower to help curls form without frizzing and stay moisturized. Comb through the strands, using your fingers. Opt for sulfate-free shampoo to gently wash hair as it moisturizes. Sulphate-free products will clean your hair without removing the natural. Some with curly manes tend to use conditioner alone when washing their hair. Decide what routine works best for you and your hair’s texture. Always rinse with cool water is it works better for curly hair. Cool water causes the hair shaft to lie flat instead of causing frizz. When it comes to blow-drying curly hair, many often forget to section the hair – ultimately causing frizz and dull ends. While you don’t need to make large sections, section your hair to about 6-8 sections. Several curly-haired women complain that their hair often turns out uneven in different sections of the hair. The problem is due to product application and blow drying style.Be sure to section your hair to ensure that you’re applying the product evenly. For curly hair, the smaller the sections, the better. This way, you will be able to section your hair better and give it the attention it needs with an even amount of product. If you don’t use a diffuser to dry curly hair, start now. When done correctly, diffusers can be very beneficial to curly hair as it can reduce the air velocity from the hair dryer – allowing you to dry your hair without affecting the curl pattern. Additionally, using a diffuser saves drying time as it allows you to maximize the wavy volume, giving the illusion of a full curly mane. Why should curly girls diffuse? Use a warm or cool setting instead of a high heat setting to prevent dry and brittle hair. Place the diffuser from the ends of your curls to your scalp. Be sure not to place them awkwardly as they will remain the same when they are dry. Allow the blow dryer to run on medium to low air pressure and don’t move the hair dryer. Curls don’t need much heat as they may over-dry. 1,400 watts is enough to effortlessly style and blow dry curly hair. Stick between the medium and low settings for air flow and temperature. On humid days, allow the hair to air dry. Adding heat will definitely add frizz. Air dry curls as often as you can. 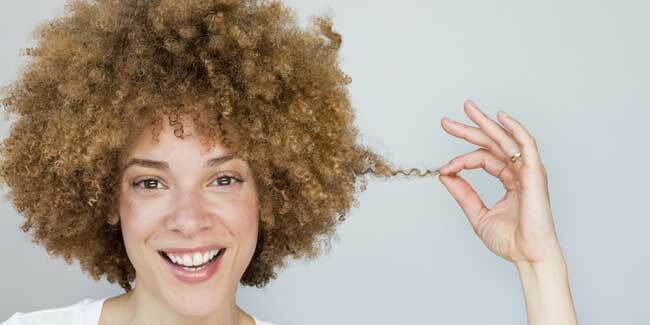 Does your curly hair often feel crunchy? 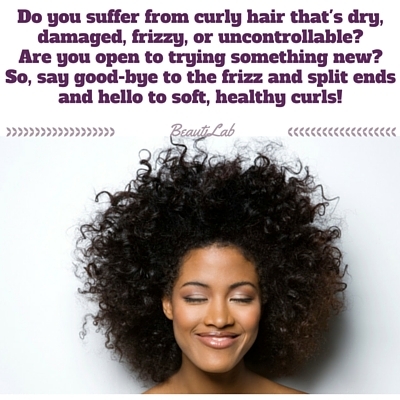 Sometimes we often tend to overload on products and even use the wrong products for our curly hair. A dab of oil is enough to leave hair soft without the crunch. Use light oils such as Argan or Marula oils. Grab your hair as if you are styling a ponytail to evenly distribute the oil. To keep curls fresh and bouncy, spray them with a mix of water and leave-in conditioner. Curls may experience less bounciness after the 2nd or 3rd day of washing. Apply a quick spritz of leave-in conditioner to help reactivate the hair and revive curls instantly. Section hair in pieces and begin at the bottom. Use a large barrel round brush in the same hand you write with. Use the pinky finger of the hand holding the dryer to pull a section of hair away from your head. Run the round brush on the underside of your hair while you point the nozzle of the dryer toward the top. Repeat on the same section of hair as needed until dry. Wind the round brush inward toward the ends to dry them facing toward you. This will keep hair long and only curled in at the ends. To achieve a looser wave, curl the round brush higher up the shaft of your hair and twist as you pull it out. This will create a loose wave, but not as curly as with a curling iron. Repeat this until you reach the top of your head and hit everything with a cool shot before giving one last brush. Keep using the paddle brush on the underside of hair taking care to blow dry the ends completely. Only point the brush inward at the ends so much as you want the ends curled in. Part your hair to whichever side you prefer as you dry and let separate sections down. Finish off with a cool shot and light mist of holding spray before any last brushing or finger fluffing. Blow-drying is one of the tools that we not only use to define our hair, we also use to define our individuality, and our individuality should never come at the cost of our hair. Below we have the basic steps on properly blow-drying your mane. Make sure that your scalp has all hair care product residue removed as best to your ability. Use a shampoo that locks in moisture, and provides a powerful heat guard. Condition with a complimentary serum that will smoothen and seal cuticles later on as you are heat styling. When you step out of the shower, imagine blotting out a paintbrush onto a clean canvas, and do the same with your hair onto a dry towel. Gently blot your hair until it is, for the most part, dry. Section your hair carefully into even strands, working your way from the bottom of your scalp all the way to the crown. 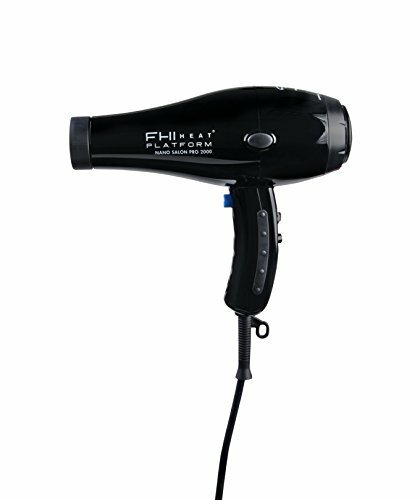 This will ensure even distribution of heat amongst individual strands as you are blow-drying. Begin blow-drying from root to tip, with a nylon brush and blow dryer moving away from the head. Keep the consistent rate of motion as you move hair dryer. Move along the remainder of the sections you made up earlier, and try to leave a small amount of dampness. Allow the sections to set for a short amount of time, and then, apply a finishing product to hold the look into place. A blast of cold air from the cold setting on your hair dryer also works well to lock styles. From lightweight to traveling well to the perfect built-in diffuser, you’ll be rocking your curls better than you ever have before. It’s no easy task to find the perfect dryer, and curly hair is certainly no different. But we just know we’ve found you the 3 best hair dryer for curly hair among all the options in the market.